Left tae richt Lovell, Swigert, Haise, 12 days efter thair return. 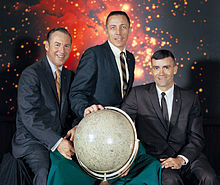 Apollo 13 wis the seivent manned mission in the American Apollo space programme an the third intendit tae laund on the Muin. ↑ Orloff, Richard W. (September 2004) [First published 2000]. "Table of Contents". 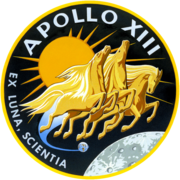 Apollo by the Numbers: A Statistical Reference. NASA History Division, Office of Policy and Plans. NASA History Series. Washington, D.C.: NASA. ISBN 0-16-050631-X. LCCN 00061677. 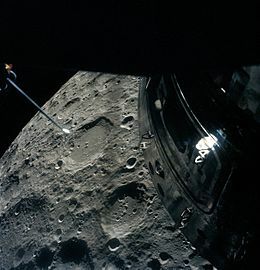 NASA SP-2000-4029. Retrieved April 15, 2012. This page wis last eeditit on 8 Dizember 2015, at 17:52.